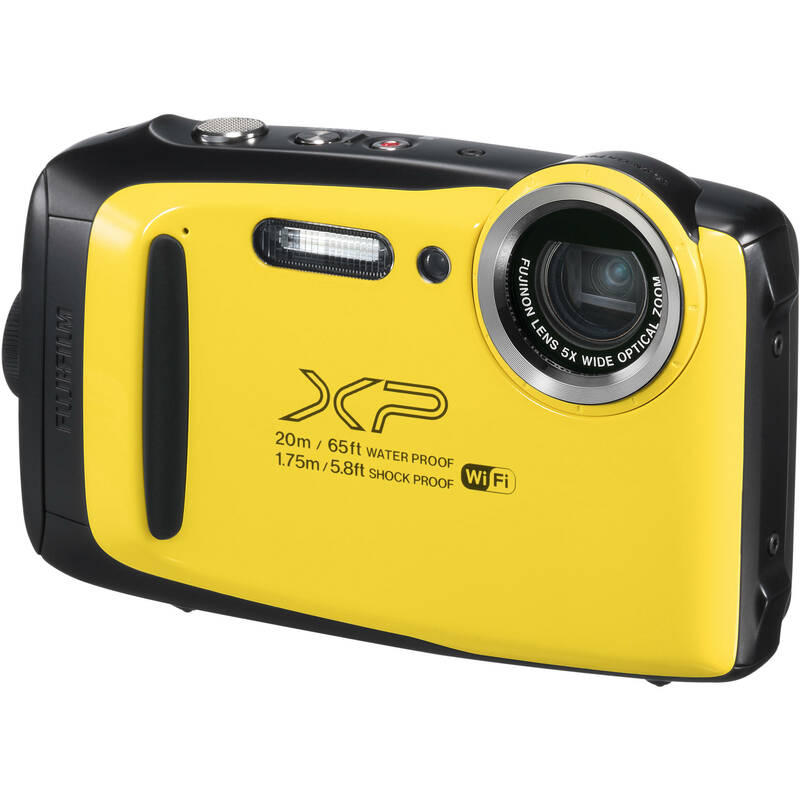 Distinguished by its durability, the yellow FUJIFILM FinePix XP130 is a rugged compact camera featuring a well-connected interface and versatile imaging capabilities. Revolving around a 16.4MP CMOS sensor, this camera can record high-resolution stills at up to 10 fps and Full HD 1080p video, and the sensor's back-illuminated design maintains smooth, low noise image quality when working in difficult lighting conditions. Complementing the imaging assets is a Fujinon 5x optical zoom lens that covers a 28-140mm equivalent focal length range for working in a variety of scenarios, and optical image stabilization Minimizes the appearance of camera shake for sharper handheld shooting. As a waterproof, shockproof, freeze-proof, and dust-sealed camera, it is well-suited for nearly any adventure, ranging from snorkeling trips to mountain ascensions, or even just for day-trips to the pool. Box Dimensions (LxWxH) 5.75 x 5.5 x 2.0"
FinePix XP130 Digital Camera (Yellow) is rated 4.4 out of 5 by 8. Rated 4 out of 5 by Michael from Waterproof I bought the camera for kayaking trips to take photos of friends paddling through rapids. The camera does not function well in low light, but I kayak during the day, so that is not much of a problem. It took some practice to get used to the auto focus-the first photos I took were not in focus. But I am getting used to what I need to do. Of course, the photos are not the quality I get with my Nikon D750, but I did not expect them to be. The Fujifilm XP130 is adequate for why I purchased it: waterproof, carry in my pocket, and pull out to take adequate quality photos and videos quickly. Rated 5 out of 5 by John from Fujifilm FinePix Cameras have always been my go digital. I have always trusted and have never been disappointed with Fujifilm FinePix. This XP130 is very exciting to use. The fact it is a camera that can be used underwater is five stars for me. Macro underwater shots in local ponds and creeks is great. I love to take nature shots and this roughed little camera has more going for it and the features are wonderful. The price is more than well worth it. My only con is I'm left-handed which means sometimes I have minor issues as to where I should be putting my fingers. Rated 4 out of 5 by Mark from Okay for the price , impression is light and all plastic. I chose the XP-130 because of its claim to be rugged and waterproof and because I didnt want to spend too much coin on a backup camera. I plan to use it as a substitute for my Iphone for the shooting range, hiking, cycling, the beach, etc. I dont intend to submerge it underwater. The controls are simple, easy to learn, takes pictures just fine. zoom lens is all internal, the lens does not expand to zoom. I wonder why Fuji did not build in a retractable objective lens cover for a rugged purposed camera? Compared to my previous compact point and shoot a Canon power shot, the Fuji XP130 feels light and overly plastic, where as the Canon power shot is metal and feels heavier and more robust. Rated 5 out of 5 by David from Fun at the beach A great time at the water park and the beach. Rated 5 out of 5 by Robert from Worth the wait In a word, super in all respects.? For the money, you can't beat it. Rated 4 out of 5 by Troy from Waterproof camera I purchased the camera for an upcoming trip to Florida. I have just been playing around with the camera a little so havent had the chance to run it through its paces. What little I have done so far I like the camera. Rated 3 out of 5 by Ken from Disappointed because could not connect to Sprocket printer. Bought this because it has bluetooth. Have not been able to connect to printer although could connect to phone. Dos it come with the battery.? What is the maximum size memory card this camera will take? 16GB? 32GB? or larger? Can I use a Lexar memory card (such as this one: https://www.bhphotovideo.com/c/product/1191363-REG/lexar_lsd128crbna2000r_pro_2000x_uhs_2.html?ap=y&amp;gclid=CjwKCAjw0oveBRAmEiwAzf6_rGKi7ss5iuuF5RT2HskWkLbQQqgJ_FmykGJOzI75iJjPlwc3BNDNmxoCTLIQAvD_BwE&amp;smp=y)?